Our Glen Providence Park Bird List is up to 100 species, so… it’s time to look for some more! June is a beautiful time of year for a morning walk in the park, with flowers, dragonflies and butterflies; and the ethereal song of the Wood Thrush and other bird calls will fill the woods. And bird walks in the park are a great way to honor George and Eleanor Butlers’ donation of this land as a Bird Sanctuary and Arboretum! This bird walk will be led by cousins Al Guarente and Nick Crocetto of the Birding Club of Delaware County (BCDC). These cousins have been active birders since childhood, and are a wealth of birding knowledge. Al led our February 2012 Bird Walk, and Nick co-led our November 2012 Bird Walk. They both contributed to our 2012 Birding Big Year, in fact Al announced it on the BCDC blog before we did! Whether you are a novice or experienced birder, come explore the park with us! Be prepared for steep hills, and uneven (possibly wet) terrain: wear your hiking shoes, and bring a hiking pole if you use one… and of course binoculars! 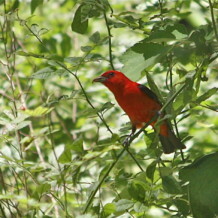 Photo is a Scarlet Tanager on the Shingle Mill Trail in June 2012.